What are participant types for? On the Settings page you can define whether or not you wish to use participant or ticket types. Start by creating the event normally. On the Settings page, select The event has different types of participants. 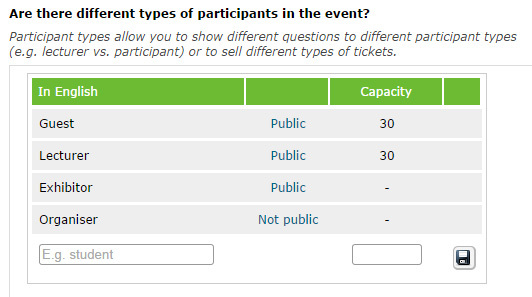 You can add a total maximum capacity for the event in: The event's maximum number of participants is ____ persons, OR define capacities for each participant type. Define a maximum capacity for each participant type by clicking on the hyphen (-) in the capacity column. You can also decide which participant types are Public and can be selected by the participants. When using Not public participant types, it is up to the organiser to define who belongs to which category or type. You can change the status (Public or Not public) by clicking on the word Public/Not public and set a maximum capacity by clicking on the hyphen (-) in the capacity column. Before proceeding to the registration page and registering, every participant must choose their participant type of all the listed public types (see first picture). You can also give a short introduction or instructions to the participant by adding an introductory opening text to the selection page.